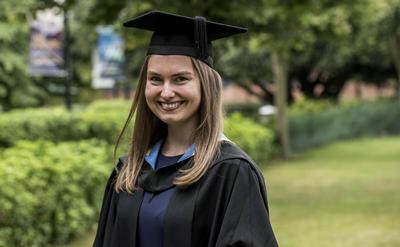 A University of Southampton student will receive a prestigious award from the Royal Geographical Society (with the Institute of British Geographers) for the best undergraduate geography dissertation in the UK. Natasha Wallum, now studying a MSc at Southampton, has been named as this year’s recipient of the Alfred Steers Dissertation Prize. The prize recognises her excellent and substantial work on the subject of modelling the effects of climate change and sea-level rise on soft cliff coastlines. Dr Julian Leyland, Associate Professor in Physical Geography at the University of Southampton and Natasha’s dissertation supervisor, comments: “Natasha’s was the top dissertation in Geography and Environment at Southampton in 2017 – ranking amongst the very highest marks that we have ever awarded within the department. Natasha previously won the University’s Florence Miller and Boswell prizes, which are awarded each year to recognise outstanding academic work by students in Geography and Environment. She has also been honoured with the Marjorie Sweeting dissertation award from the British Society for Geomorphology. The Royal Geographical Society (with IBG) essay prize is named in honour of Professor Alfred Steers, who was Professor at the University of Cambridge for 17 years and was Honorary Vice President, Honorary Fellow, and medallist of the Society. In total, 21 individuals and groups have been recognised by the RGS with a variety of awards. Natasha will be among the recipients at a ceremony taking place on Monday 4 June 2018.